Hello, rSt, thank you for pointing this out. I double-checked the comprehensive ruls and you are correct. 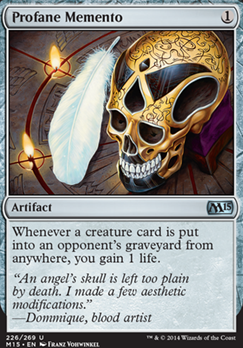 Profane Memento will still trigger from opponent's creatures going to their graveyards but your Bronze Bombshell will not trigger it. 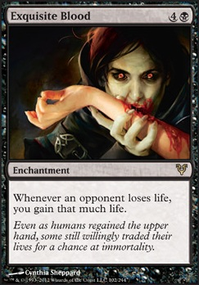 Deathgreeter or Blood Artist could be good replacements though you risk losing them to an opponent when Endless Whispers is in play. Would Profane Memento work the way you want it to? Don't creatures go to their owner's graveyard when they die, regardless who the controller is? hkhssweiss is totally right - Tower and Vessel are always welcome and since Tower can be tapped for mana right away - it doesn't slow You down. If ya wanna mill You opponents think about Bloodchief Ascension, Dread Summons (Brrrrraaaainnnsss), and Profane Memento (I like to build decks different way than the majority of players so when I bumped into Memento by accident at M15 prerelease - I decided to put it in my Phenax modern deck. Effect? Far beyond expectations!). 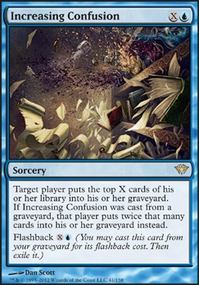 I'm wondering if you could replace The Rack with something that interacts better with the cards that your opponent will be discarding and putting in their graveyard. If you were using something like The Rack, you would actually want your opponent to have more cards in their hands, and not to discard them so they have less. Here are some cards that might work well with your opponent's discards: Profane Memento, Geth, Lord of the Vault, Gruesome Encore. I hope this is useful! Profane Memento is too strong because it gave extra life also when The Horde was attacked. Authority of the Consuls follows the same path. It's very good against The Horde, undoubtedly. 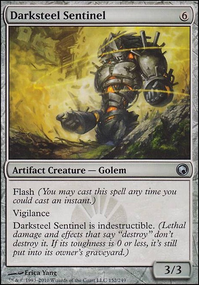 It's on the fine line, but I wouldn't ban it because I see this card played a lot. We should avoid to force people modifying their deck only to play Horde Magic. 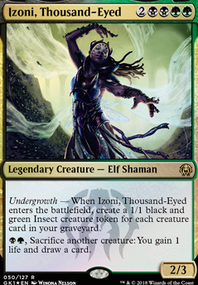 Maybe just house-rule the card to give life only to nontoken creatures. Or add more Bad Moon effects to The Horde to counterbalance the lifegain. The "extra turn" this card is giving the Survivors' team by tapping The Horde's creatures, like Blind Obedience, is also neat. It's a great advantage to see what's coming. But not ban-worthy according to me. I would like to say that a few Horde-chasing cards are acceptable in a 99-cards deck. I've already taken a look at your "Survivors' decks." I really like the idea and themes you built. I'm curious if it works well for you. If it does, I would probably follow your idea and build mine based on your lists. And of course this format doesn't suit to (semi-)cEDH decks. It's for casual playtime! • Nihil Spellbomb was omitted from the Loot deck because there are already two very good grave-hate cards, and also the shovel. • The Horde's Zombie tokens are put onto the battlefield, not cast. Therefore, they don't trigger Demon's Horn. Gawd dang! 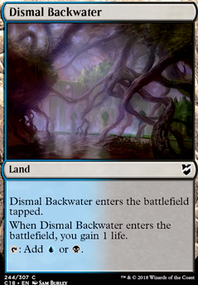 I would love to come across this one down at my local FNM! Your strategy is clear and focused and brutal. The only recommendations I can even think of are just a bit more interaction that frees you to pop off unabated. Maybe 3-4 copies of Inquisition of Kozilek and/or Thoughtseize would be phenomenal. And both could give you the information that might just be critical. I can't imagine this one being very fun against a real burn set up though. Not sure what type of answers I would advise there. 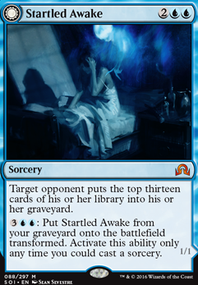 Spellskite is a pretty standard response but it is even more advantageous when you run blue. oh and real quick, for the sideboard, I might advise a Ratchet Bomb or two for some optional permanent removal. It might be more efficient at times then Echoing Truth if you need it to be and don't have to worry about not being able to flash it back. Though I would probably replace some copies of Profane Memento to make the room if you need it. Have you been able to test this much at your local venue? Any decks that you consistently have issues with?